The Lusaka Magistrates’ Court has ordered that UPND leader Hakainde Hichilema and five others be brought to court on Wednesday because they are complainants in a case where they want religious minister Reverend Godfridah Sumaili cited for contempt. And the Director of Public Prosecutions applied to take over the proceedings in the contempt case against Rev Sumaili. But the defence has rejected the DPP’s takeover of the case. When a public prosecutor Angela Nyirenda and private prosecutor Gilbert Phiri called the case, Rev Sumaili’s lawyers Eric Silwamba and Lubinda Linyama placed themselves on record. At this point, deputy chief state advocate Mariam Bah Matandala informed the court that the DPP had taken over the proceedings pursuant to Article 180 of the Constitution. The complainant’s team said it would be led by Jack Mwiimbu who had stepped out of court. Matandala, however, reminded the court that the DPP had taken over the proceedings. And magistrate Wishimanga then summoned parties to her chambers. When the parties returned, Mweemba recalled the case and told the court that his team would like to be heard on the point of law in view of the DPP taking over the proceedings. “Section 199 of the Criminal Procedure Code requires that the complainants are supposed to be in court…That being the point of law, we can’t put the cart before the horse and begin advancing arguments in luminar in the absence of the complaint. We cannot start debating this issue when people who have brought us and who are witnesses are not before court. When it is a fact there is a clear order of this court dated 14th June 2017 directed to the Commissioner of Police Central Province, Commissioner of Police Lusaka Province, Commissioner of Prisons, deputy Commissioner of Prisons and police officer-in-charge Lusaka,” Mweemba submitted. And in her ruling, magistrate Ireen Wishimanga said she had no proof that the order directing that HH and five others be brought to court was served on the police and prison authorities. She said if there was proof of service of her order dated June 14, she could have cited the police and prison authorities for contempt. Below are excerpts of the proceedings before magistrate Wishimanga. Public prosecutor Angela Nyirenda calls the case of Godfridah Sumaili. Sumaili’s lawyer Eric Silwamba: May it please your honour. My name is Silwamba initials E.S of Messrs Eric Silwamba, Jalasi and Linyama Legal Pactitioners. Mariam Bah Matandala from National Prosecutions Authority (NPA)takes the floor: I am deputy chief State advocate. We are taking over the proceedings of this matter pursuant to article 180 (4)(b) of Constitution. Matandala: We are wondering what this is…we thought we said that we were taking over the proceedings. Magistrate Wishimanga summons parties to her chambers and after a few minutes, the court resumes. Mweemba Recalls the case: Most obliged the court guided. We have liased and following the application by DPP to take over the proceedings, we would like to be heard on the point of law. Section 199 of Criminal Procedure Code requires that the complainants are supposed to be in court or at least their legal representative. That being the point of law, we can’t put the cart before the horse and begin advancing arguments in luminar in the absence of the complainants. We cannot start debating this issue when people who have brought us and who are witnesses are not before court when in fact there is a clear order of this court dated 14th June 2017 directed to the Commissioner of Police Central Police, Commissioner of Police Lusaka Province, Commissioner Prisons, deputy Commissioner of Prisons and police in charge that the complainants be brought before court. This is the order of court under the hand of this court and this order has not been complied with. The Constitution is very straight forward, we cannot come here to start advancing arguments on a point of law when the complainants who should have been here are not before court. We did serve and filed the affidavit of service and exhibited the letter for receipt of the order where it was very categorical that the complainants who are in custody needed to be here in court today. We ask the court to order an inquiry on why its order under the hand of this court was not complied with. Once this issue is addressed, then we can go into other issues of the office of DPP taking over these proceedings because on that one as well, we have a say. And we would like to be heard on record. My learned brother will supplement the arguments. Gilbert Phiri: Proceeding on what my learned brother has advanced and in the interest of preserving the integrity of this court and indeed preserving the integrity of the judiciary, the order of this court of 14th June is a foundation issue and we submit that no further proceedings should ensue henceforth until the complainants are brought before court. In that regard, our application is that this matter be stood down to the afternoon. Kabwe is just 30 minutes, we need to preserve the integrity of the judiciary. May this matter be stood down to enable the complainants be brought before this court. That is our submission most obliged. Silwamba: Your honour, this matter is coming up for plea and my client in obedient with the summons and has attended court. Mr Mweemba has cited section 199 of the CPC as a matter of fact; it’s a defence that should have been arguing this section. When the accused appears and the complainant is not available, this court has two options – to dismiss the charge or adjourn the case. As the defence, we are not unreasonable. The complainant is facing a capital offence…the complainant is incarcerated, so we wish to say as defence, we have no objection for the adjournment of this matter if the State so wishes. On behalf of my client, we don’t agree with counsel on the order of business. The order of business is that the court must resolve the issue of locus standi of the legal practitioners who want to prosecute this matter after the DPP has indicated that it has taken over the proceedings in terms of Article 180 of the Constitution. Phiri: We wish to object that talking about Article 180 of the Constitution is veering into the province of the substantial arguments. I think the issue as registered was the absence of the complainants before this court. In fact, I also wish to state that it’s not one complainant but they are five others. Another of Sumaili’s lawyers Lubinda Linyama: We wish to react…it’s pertinent that the court highlights how we proceed in view of DPP taking over the proceedings. This development of the DPP taking over the proceedings of the matter is vital and can’t be glossed over. If I heard my colleagues correctly, they are lamenting that the order has not been obeyed. They know what they should do and I have not seen a formal application. We would like to address the issue of locus standi of private prosecutors in view of the DPP taking over the proceedings. Mweemba takes the floor and before he addresses the court, he places other lawyers Marshal Muchende, Martha Mushipe ad Zevwanji Sinkala on record and tells the court that more will be placed on record. Mweemba: When an issue arises before court, the court is expected to make a ruling and there is an issue that has arisen. The first issue is the order of this court has not been obeyed. If our colleagues from the other side are saying we need to make a formal application, we will not go there because the court has powers to order the appearance of those officers. The issue at this stage is why are the complainants not before court. We cannot jump the gun…we can’t start arguing the issue of take-over when the complainants have not been brought before court. So it would be premature for us at this stage to start addressing issues of locus standi and that issue of locus standi does not arise at this stage at all. We shall adequately respond to the issue of take-over by the DPP because we have been through that path all the way to the Supreme Court. So we will address it at the right time…we will argue those issues at the right time. For now, the court should address why the order under the hand of this court has not been obeyed and to stand down this matter. The State would not suffer prejudice. We agree with the defence, they have not objected. We request to stand down the case to the afternoon to secure the attendance of the complainants. Another of Hichilema’s lawyers Marshal Muchende: We here at the bar are officers of the court and the senior most is State Counsel Silwamba. Our fundamental duty to our functions is to the court, we are required by our oath to preserve the integrity of this court. It should raise the hairs at our back if we hear that there is an order issued by the court which has not been obeyed, whether anybody likes it or not. That should in…and of itself put a stop to any other proceedings until there is total compliance to what the court ordered. Now it is even the court’s own duty to ensure the public are not taking it for granted by glossing over its orders; that is an insult to the court. The court should put it’s pen down and stamp its foot and demand that all those it ordered should appear before it…this is how courts earn respect and confidence of the people and against individuals who may think they are above the law. We reiterate the prayer that this court must insist on full and total compliance of its order dated 14th June, 2017 and in furtherance of provisions of section 189 of CPC. The lawyer for the avoidance of doubt goes through those ordered again. The said order goes further to demand that the complainants be brought before this court to attend to these proceedings. The officers so cited are clearly in violation of the said order and therefore, contemptuous of court proceedings. I reiterate the submissions by my learned colleagues that this matter be stood down to allow the complainant to be brought before this honourable court. The provisions of section 116 of the Penal Code are very clear and should these officers continue to defy the said court orders, they should be cited for contempt of court. Court asks Matandala if she wishes to respond. Matandala: We already indicated our position. And in her ruling, magistrate Washimanga orders that Hichilema and five others be brought to court on Wednesday. She said failure to bring the complainants to court on Wednesday would force her to cite the officers for contempt. Magistrate Wishimanga said she could not cite the prison and police authorities for contempt today because there was no proof that they were served with the order. 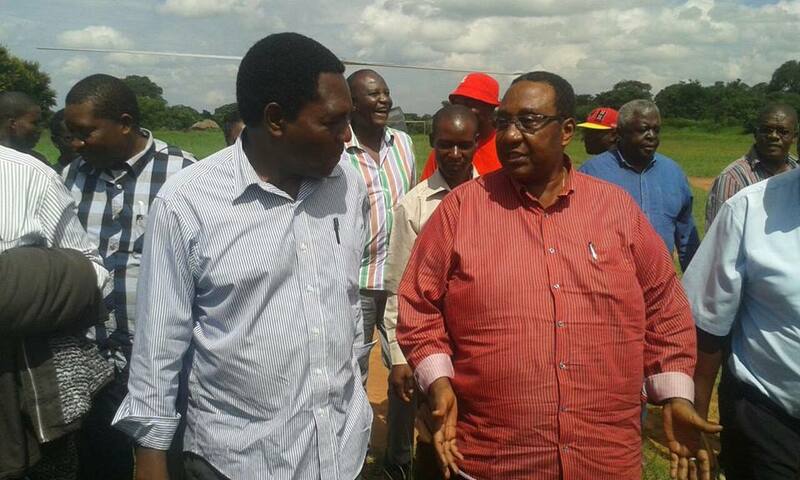 The magistrate also said Hichilema’s lawyers had objected to the taking over of proceedings by the DPP. The mater comes up on Wednesday at 12 hours.